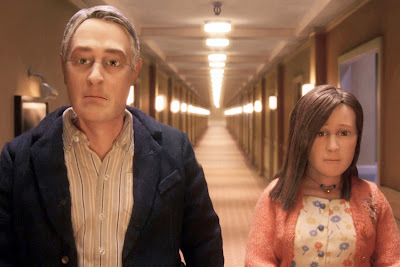 Anomalisa, written by Charlie Kaufman and directed by Kaufman and Duke Johnson, is a film that I respect but don't love. I respect it because its ideas have been rigorously worked out in the script, cinematography, animation and soundtrack. It's a film that is extremely clever in revealing the nature of the main character and uses animation in original ways. My problem is that for all its excellence, it is a cold film. Michael, the main character voiced by David Thewlis, is stuck in a depressed state and by the film's end, does not understand himself any better than he did at the start. He's needy, presumptuous, impatient, selfish and ultimately clueless as to his own nature. It was difficult for me to spend time with him or to care what happened to him. Michael is an expert in customer service traveling to Cincinnati to give a talk at a conference. By the time we learn this, we've seen him interact with many people in the hospitality industry, all of whom behave in ways that Michael would endorse. However, he's so wrapped up in his own head that he can't appreciate the service he's being offered and is so distracted that he comes off as brusque. As the film progresses, it becomes clear that every character except for Michael has the voice of actor Tom Noonan and all have identical faces, whether they are male or female. While Michael's speech to the conference emphasizes treating customers as individuals, he himself is incapable of seeing people that way. The only person that looks and sounds different to him is Lisa, voiced by Jennifer Jason Leigh, who is there for the conference and is damaged in her own way. Lisa has a scarred face and crippling self esteem problems. When Michael invites her to his room, she assumes that he would be happier with her friend. After spending the night together, Michael wants to run away with her. Her life is so empty that she agrees, but when they breakfast together, Michael finds flaws in her and her voice transforms into the the generic voice all the other characters have. Michael can't accept people as they are, which is why all his relationships end with him unhappy and isolated. At the end of the film, Michael returns home to his wife, child and a house full of guests, but the final image of Michael is him staring at a mechanical doll, unable to relate to any of the people around him. By contrast, Lisa seems grateful for the attention she received and seems renewed by the tryst. While this film looks like it could have been done in live action, stop motion is used to distance the characters from reality enough to make the audience aware of the difference. The puppets are about five heads high, proportioned with slightly larger heads than real people. There is no attempt to hide the seams on their faces that separate the parts that are replaced frame by frame. The animation successfully communicates the characters' emotional states. That's what animation is supposed to do. The facial and hand movements are subtle. Michael and Lisa are individualized through their movement. The acting avoids animation clichés and grounds the characters in understandable human emotions. The direction, cinematography and art direction are impressive. Michael's hotel room and the corridor outside it successfully capture the generic look familiar to anyone who has stayed in a North American hotel. The lighting of the characters and sets is exceptional. While lighting in cgi has advanced tremendously, it still can't match the beauty of live action lighting. The camera moves are fluid and generally unobtrusive until they need to add emphasis. The sound effects bolster the reality of the world that the puppets move through. For all of this film's accomplishments, it's difficult to do a story about a character who can't change and who ends up where he began. The audience learns more about the character over the course of the film, but as the character is not very appealing, it's hard to engage with him. The central character, while fully realized, is the film's weakest point. While I don't care about the Academy Awards, this film and Inside Out are both nominated in the Best Animated Feature category and I suspect that one of them will win. They are opposite in many respects. One is cold and the other is warm. This film is tightly structured while Inside Out is a bit of a mess. I suspect that the Academy will go with the feel-good film, but there is no question that Anomalisa, in spite of its coldness, has taken animation in a new direction in terms of subject matter and technique. It presents possibilities, something that Pixar hasn't done in years. While I can't say I enjoyed watching this film, I'm glad that I saw it and glad that it exists. Anomalisa is a direction worth pursuing. Can you imagine an election where a winner is declared but the vote totals are kept secret? Can you imagine a lottery where someone wins, but they won't tell you the winning number? Can you imagine a Superbowl where one team gets the glory, but nobody knows the final score? Welcome to the Academy Awards! What is copyright? It's a privilege granted by law. Like many things determined by people, as opposed to nature, there's a certain arbitrariness to it. Why is the speed limit 60? Why is the voting age 18? Why are certain days holidays? It's important to remember that at various times and places, the answer to the preceding questions were different than they are now. So it is with copyright. Why was copyright created? Why was this privilege granted to people who create new works? It was invented to provide an incentive to create, balanced with a social need to enhance the culture. If someone wrote a novel, or a play, or painted a picture and anyone could make copies to sell, what would be the incentive to invest the time and effort to create? Why work hard so that others, who had nothing to do with the creation, could profit? Creators needed protection to make their investment of time and effort worthwhile, so they were given a temporary monopoly on their creations, allowing them to be the sole financial beneficiaries of their work. The fact that this monopoly is temporary is the price creators pay for their exclusive rights. Yes, the law will protect a creator so that they can profit from their work, but only for a fixed period. Why? So that society as a whole can be enriched by that work after a time. When a copyright expires, anyone can republish the work or use it as the basis for something new. Today, anyone can use the work of Charles Dickens or Mark Twain and culture is richer for that. You can profit from the work of others but only after they have had the chance to profit from it themselves. In principle, copyright works. However, just as a speed limit or the voting age can be changed, the length of the monopoly can be changed. Unfortunately, it has only been changed in a single direction. While the original copyright law in the United States was for 14 years, the current copyright law is for life plus 70 years for individuals and 95 years for corporations. Until 1976, not all that long ago, copyright lasted a maximum of 56 years. If that were still true, anything created in 1959 or earlier would be in the public domain. That includes a lot of Disney films and other Hollywood product. It includes most or all of Hemingway, F. Scott Fitzgerald, George Gershwin, Irving Berlin, Norman Rockwell, and works starring Superman, Batman, Captain America, Conan, Flash Gordon, Little Orphan Annie, etc. The Trans Pacific Partnership, a 12 nation trade deal that has yet to be signed and ratified as of this writing, would extend copyright in countries, such as Canada, to match the current U.S. standard. In Canada, the law is currently life plus 50 years. What would happen to the 20 years worth of material considered public domain in Canada if Canada ratifies the TPP? Would publishers be forced to negotiate licenses after the fact with the once and future copyright holders or withdraw the material? Would they be compensated for losses? Nobody knows. Another arbitrary aspect of copyright law is enforcement. Technically, any fan fiction or art that is made publicly available, even if there is no money involved, is a copyright violation. Often, copyright holders don't enforce their rights, either because they don't think the violators are enough of a threat to bother with or they are unaware of the violation. At comics conventions, there are some characters that are understood to be off limits for fan art and others that are not. There are all sorts of films on YouTube that are a violation of copyright. Some have been there for years. Where's the line between being beneath a copyright holder's notice and provoking legal action? The problem is that there is no line. Or rather, the line comes and goes on a case by case basis. For instance, Paramount and CBS have instituted legal action against a Star Trek fan film, financed on Kickstarter to the tune of $1 million. Apparently there have been earlier Star Trek fan films made without incident, but this one is a target. Where's the line? Was it the money involved? The high profile? Or did a lawyer wake up grumpy? In the U.S., if some entity creates a cure for cancer, they get only a maximum of 20 years to benefit (and some of that time is often used up before the government approves a drug for sale). After that, other companies can create generic versions without the expenses associated with developing a drug. But Paramount gets to protect Star Trek for 95 years. What kind of society values the inventors of entertainment more than the inventors of life saving drugs? Probably the society you live in. Copyright has value. I would never dispute that. But when it is used to lock up culture, instead of enrich culture, it has gone too far. Yes, the makers of the Star Trek fan film do not have the law on their side. But no one should confuse that with whether the law is just or functional. Today, copyright is neither.